Purchasing a 1997-2004 Chevrolet Corvette can be nerve-racking if you don’t do some advance research before you spend your hard-earned cash. Let’s face it, sports cars are expensive and sometimes subject to hard driving by their previous owners. While the car may look bright and shiny on the outside, many problem areas could be lurking underneath. Don’t fret because we’ve done much of the research to help you find the fifth generation Corvette that’s right for you and your budget. One important tool to consider in your search is a vehicle history report. Carfax and AutoCheck offer downloadable apps that can be downloaded to your phone or other mobile device. This is perfect for getting reports while you are walking the dealers lots checking out Vettes. You should also take along another set of eyes with you when car shopping. Ask a friend or relative to tag along with you while you’re “kicking the tires”. They’ll be a little more objective and won’t be as emotional about the purchase as you. Walk around the car and see how well the paint matches and the body panels line up. Even if the vehicle’s history report doesn’t list any accidents, keep this in mind. Not all body shops report repairs and a previous owner may have paid for damages out of pocket to keep their insurance premiums from going up. Do the VIN numbers that appear in the door jam, dashboard, and frame rail match? Does the car have a clean or salvage title? Check to see how well the headlamps open and close. The gears that operate the mechanism are plastic and may become slow or may not rise completely. Also, ask the seller for permission to have your mechanic inspect the car. If the answer is no, you should probably walk away from this prospect. When checking out the interior, pay special attention to the seats. By now, the leather in most fifth generation Corvettes is probably starting to tear or have a considerable amount of wear. Unless it was covered, chances are the left side bolster on the driver’s seat is pretty scuffed. Also, do the seats still have plenty of support? Another area to explore is carpeting. If the carpets have unusual staining or smell peculiar, this could be a sign the car was in a flood. Check to make sure all electronic such as the radio, air conditioning, and cruise control are functional. Many fifth generation Corvette owners complain that HVAC display lighting is prone to get dark or go out completely over time. Another common quirk is a faulty gas gauge. Sometimes high sulfur content in gasoline can cause the gauge to read empty. This is usually remedied by filling up with a better quality gasoline. Open the hood and look for signs of oil and antifreeze leaks. If the car has been sitting for a few hours, see if there is any seepage on the ground. Dark stains on the hood insulation can also be a potential indicator of hidden leaks. This area is often overlooked when visually inspecting under the hood. Ask the seller if service records are available. If so, compare these to what is shown on the VIN report. Start the car and rev the engine from 2,500 to 3,000 rpm for 15 seconds and listen for any strange noises. Also, check to see if the car smokes while the engine is running. Does the car have a manual transmission? If so, when was the last time the clutch was replaced? This is a costly repair that can run from $1,500 to $2000 or more. The base 1997-2004 Corvette was powered by an LS1, 346 cubic-inch, 5.7-liter engine. It produced 345 horsepower at 5,600 rpm and 350 lb-ft of torque at 4,400 rpm. In 2001, power increased to 350 horsepower. This engine achieved an EPA rating of 16 mpg in the city and 25 mpg on the highway with the 6-speed manual transmission. With the 4-speed automatic transmission, this engine realized a 16 mpg rating in the city and a 24 mpg rating on the highway. The sportier 2001-2004 Z06 was powered by an LS6, 346 cubic-inch, 5.7-liter engine. It was rated at 385 horsepower in 2001. Horsepower jumped to 405 horsepower for the 2002-2004 model years. This version of the Chevrolet LS6 V8 engine was only offered with a 6-speed manual transmission. The EPA rated the Z06 at 19 mpg in the city and 28 mpg on the highway. Fifth generation Corvettes were subjected to a few recalls. One of these recalls involved the steering column lock. The Vette is equipped with an electronic column lock which prevents the steering wheel from being turned when the engine is off. It was also designed so that if the column doesn’t unlock when the vehicle is started, the fuel supply is disrupted. However, the fuel shut-off may fail if an electronic control doesn’t work, and the car could be driven with the steering system locked. This recall spanned model years 1997 to 2004. Another recall concentrated on seat belt lap belts. Lap belt webbing could twist allowing the webbing to become jammed in the retractor and possibly cause the belt to become unusable. This recall was for model years 1997 to 2000. By doing your homework and a little research, finding a great 1997-2004 Chevrolet Corvette shouldn’t be that complicated. We hope these tips give you an idea of where to start and what to look out for when shopping for a great used Corvette. 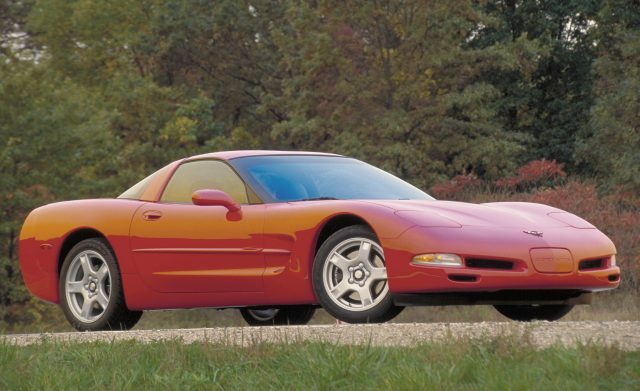 1997: During its first year of production, the fifth generation Corvette was only available as a coupe. 1998: The convertible made its triumphant return. The Corvette convertible was also chosen as the official pace car of the Indianapolis 500 for the fourth time. 1999: The new Fixed Roof Coupe made its debut. Popular Corvette options include the heads-up display, telescoping steering column, and Twilight Sentinel headlamps. 2000: Dual-zone climate control was now available. A new polished aluminum, five-spoke wheel was introduced this year. Two near paint colors were released – Millennium Yellow and Dark Bowling Green Metallic. 2001: The Z06 returns with 385 horsepower. Team Corvette Racing came in first and second place at the 2001 24 Hours of LeMans. This is the Corvette’s first win at this prestigious event. 2002: The Z06 is increased to 405 horsepower. For weight reduction, Corvettes equipped with the heads-up display got a thinner, 4.8 mm windshield. 2003: A 50th Anniversary model is introduced to commemorate a half century of Corvette production. Fog lamps, sport seats, and dual-zone air conditioning became standard equipment. 2004: A Commemorative Edition Z06 with LeMans Blue paint was released. 2004 would also be the final year of C5 production.